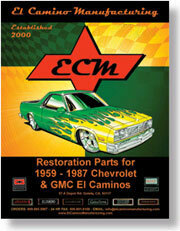 Made from the original GM tooling. They don't get any better than this. These moldings start at the front A-pillar and run along side the headliner where they tie into the molding over the back window and down along the rear quarter window. They fit all El Camino's from 78-87. Come in OEM Blue. Must be dyed to match.